I prefer 2 of these pans over one pan with 12 cups for more flexibility in a crowded oven & for making smaller batches. 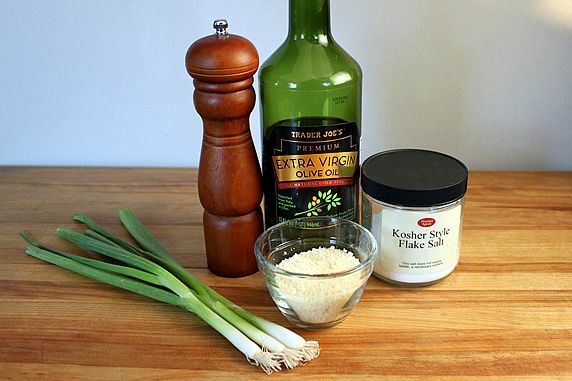 I use this for making bite-size hash brown cups that are great on appetizer platters. They're also a healthy substitute for Tater Tots. Want more easy muffin tin foods? Here are 101 Savory Snacks, Adorable Appetizers, Enticing Entrees and Delicious Desserts. Pair this cookbook with a set of muffin tins for a fun gift. I use these versatile bowls for mixing, refrigerating, and serving. They nest compactly for each storage. 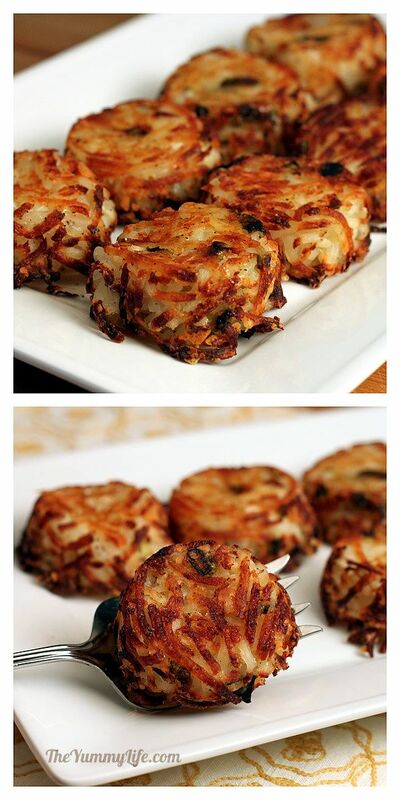 These individual servings of hash browns are convenient to make and serve. The potatoes are tender and moist on the inside and crispy on the outside. The Parmesan cheese adds delicious flavor. FOR BITE-SIZE TATER TOTS - make them in mini muffin pans. I made these hash brown cups to serve at the bridal shower brunch I co-hosted a couple of weeks ago. They accompanied quiche (made by my friend Becky), Mango Fruit Salad Salsa with Sugar and Spice Tortilla Chips, and Make-Ahead Sticky Buns. 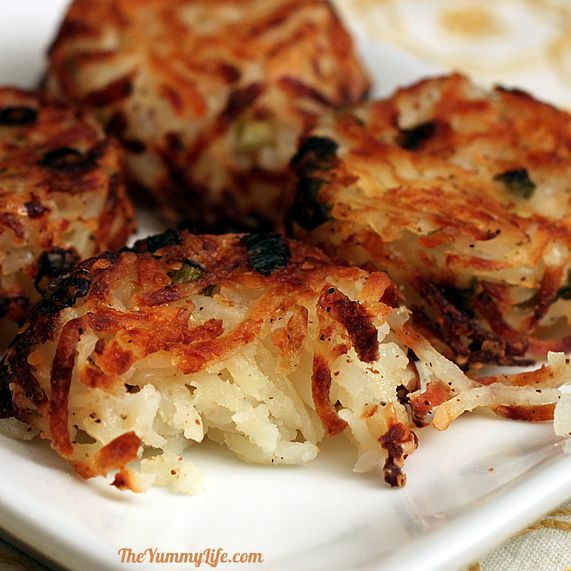 I love hash browns with a crispy exterior and moist tender interior. 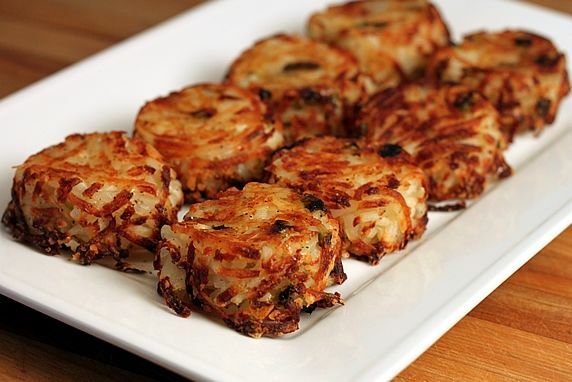 Traditional hash browns cooked on top of the stove are difficult to make in a big batch and serve to a crowd. So I tried baking these in individual portions in muffin tins that could be baked in the oven along with the sticky buns and quiche, and would be easy to serve buffet style. 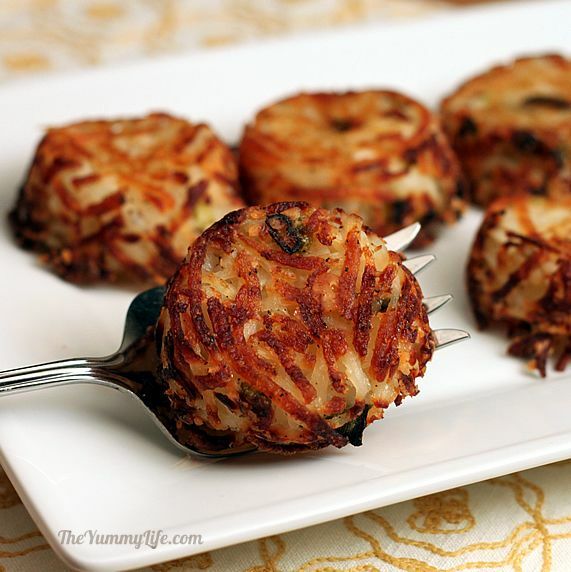 By cooking these hash browns in muffin tins, a large part of each individual serving forms a crispy, brown crust around the cup shape of each muffin portion. They remained tender and moist on the inside, just the way I like my hash browns. 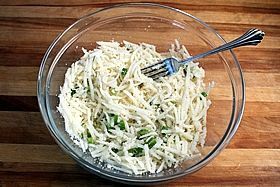 I added some Parmesan cheese and green onions for a flavor boost, and used a small amount of olive oil to help them brown. 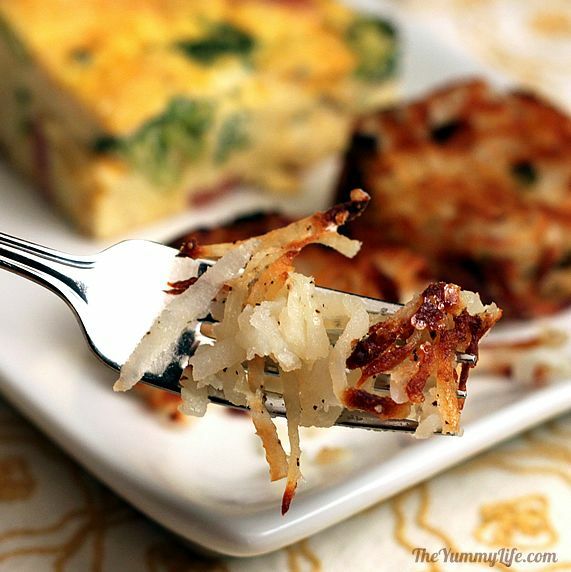 The result is a relatively healthy take on traditional hash browns that is easy to prepare and serve. 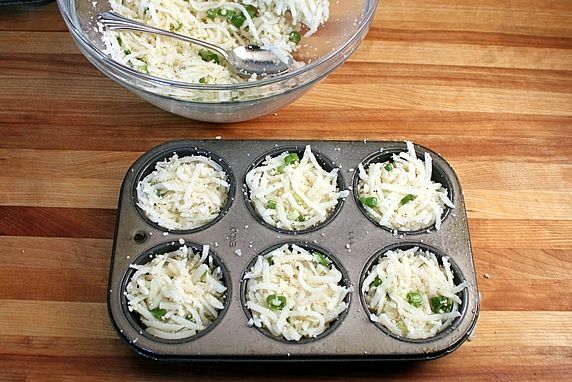 Use mini muffin pans for bite-size morsels. Use this same recipe and procedure, but bake them in mini-muffin pans for appetizer platters and "tater tots" that kids will love (and grown ups, too). 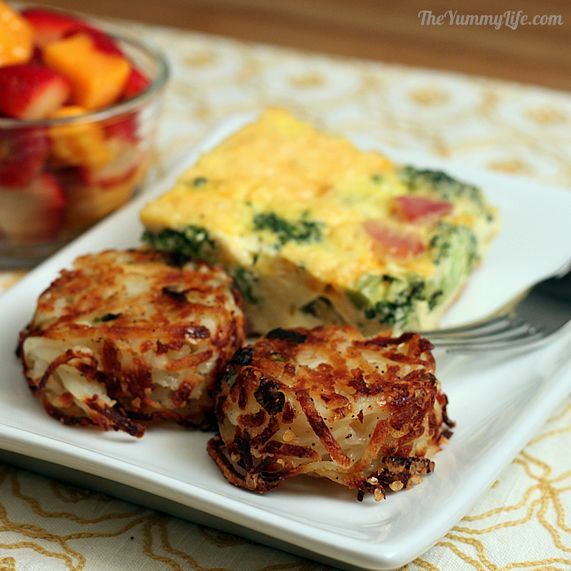 Much healthier and tastier than the school cafeteria tater tots, for sure! You also need shredded potatoes. I took the easy route and used Simply Potatoes (find them in the refrigerated section of your grocery store near eggs, butter, etc.). They are already shredded and ready to cook. 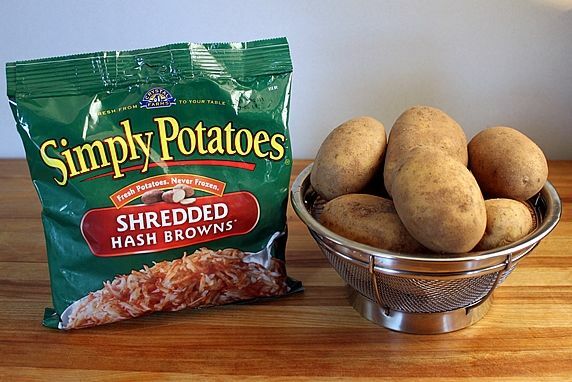 If you prefer, you can start with whole russet potatoes; shred, rinse, and squeeze them dry in a towel. I made this recipe both ways. They were both good. But to be honest the Simply Potatoes version had better texture. I have no idea why. 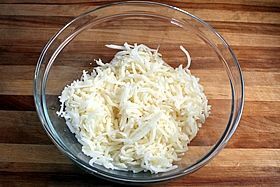 So, if you're looking for a short cut, using these pre-shredded ones is a great-tasting, easy alternative. Step 2. 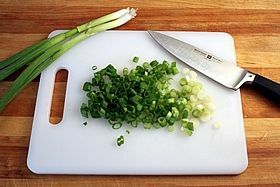 Chop the green onions--both the white and green parts. Step 3. 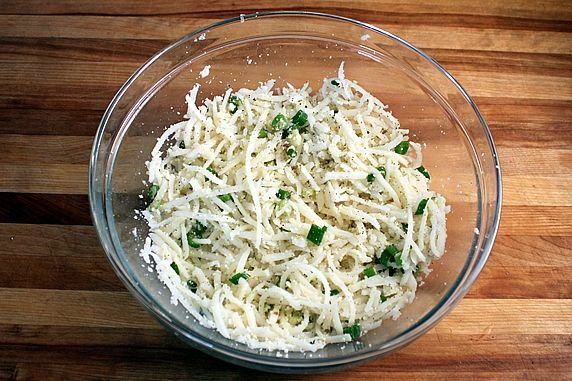 Put the shredded potatoes in a large bowl. Step 4. 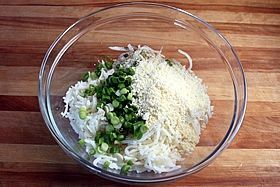 Add all of the ingredients to the bowl and toss lightly with a fork. Step 5. Spoon into muffin tins that have been coated with cooking spray. 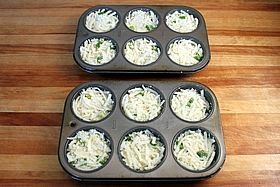 6-cup regular size muffin tins - I prefer 2 of these pans over one pan with 12 cups for more flexibility in a crowded oven & for making smaller batches. 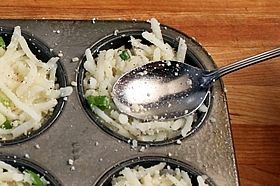 mini muffin tins - bite sized for appetizer platters and a healthy substitute for tater tots. Step 6. Gently pack them down each cup with the back of a spoon. Step 7. Bake for 60 to 75 minutes in the lower third of the oven for better browning. They shrink down some as they cook. The tops don't get brown, but the sides and bottom do. They get flipped over, so the unbrowned tops won't show when they're served. Crispy on the outside, moist and tender on the inside. Oh my, they taste good! Make and cook ahead for reheating later: No question these are best when eaten freshly baked. However, you can bake them ahead of time, refrigerate or freeze them, and reheat them before serving. They lose some of their crispiness when they are reheated, but the texture and taste is still good. So, cooking them ahead is a convenient option, especially if you're taking them somewhere else to serve. Serving size: Allow for 1-2 hash brown cups per person. For breakfast, brunch or dinner. They're perfect paired with breakfast and brunch food, and are also good as a potato side with dinner. Want more easy muffin tin foods? 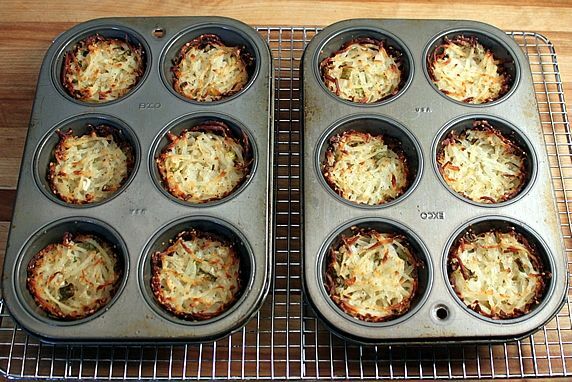 Preparing food in muffin tins combines fun eating with easy portion control. Here are 2 cookbooks I use with lots of yummy recipes. I like to pair either of these cookbooks with muffins tins for a fun gift. Muffin Tin Chef - 101 Savory Snacks, Adorable Appetizers, Enticing Entrees and Delicious Desserts. I appreciate that the author uses lots of wholesome, healthy ingredients. The Muffin Tin Cookbook - 200 easy recipes for mini-pies, pasta cups, gourmet pockets, veggie cakes, and more.